SWAP RESTRICTIVE CAT FOR 2.5" PIPE ADDS INSTANT BHP! 3" Bore Throughout For Maximum Flow & Performance! Swap Restrictive Cat For Decat Pipe Adds Instant BHP! Swap Restrictive Precat For 2.5" Pipe Adds Instant BHP! Built In Flexi Joints To Reduce Strain On Your Exhaust! Fiat Bravo 1.4i Hatchback 1368cc 90HP 67kW - Fits vehicle years May 2007 to July 2011. Materials and flex used in construction are stainless steel for longevity and strength. The Flex is double lined. Swap Restrictive Cat For 3" Decat Adds Instant BHP! Swap Restrictive Cat for 2.5" Decat Adds Instant BHP! Removes the Restrictive OEM Cat To Add Instant BHP! TWIN 2.25" SILENCED DECATS ADDS BHP & A SPORTIER NOTE! Materials and flex used in construction are stainless steel for longevity and strength. The Flex is double lined. Built In Sensor Bosses! T304 Grade Stainless Steel! VW Golf Mk V and Mk VI Decat Pipe. 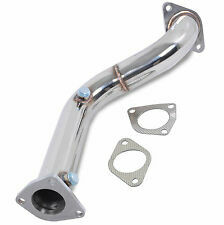 VW Golf Mk V and VI Decat and Downpipe. This is a mandrel bent decat for the Mk V and Mk VI Golf GTi which will make your car sound great and increase horsepower! We work hand in hand with enthusiasts such as yourself to make sure that you get a product that fits easily and satisfies. Swap Restrictive Cat For 2.25" Pipe Adds Instant BHP! One Of The Most Cost Effective Ways Of Releasing Power! 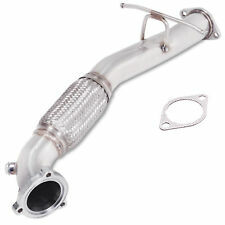 Mk3 golf stainless front exhaust silencer box vr6 gti 8v 16v. Condition is Used but in excellent condition due to not being on the car for more than a couple of months with minimal mileage. Stainless steel so fit and forget. Price is cheaper than a new mild steel item you will need to replace again within a few years. See photos for dimensions. 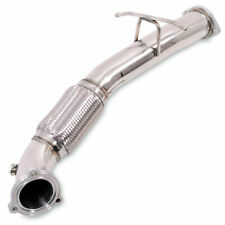 2x Universal Exhaust Turbine Muffler Resonator Stainless Steel 2.25" Inlet/Outlet 14" Long. 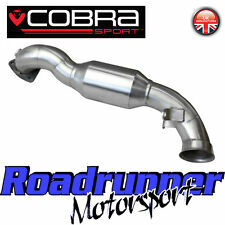 Designed to dampen exhaust noise, Facilitates undisrupted exhaust flow. The muffler that was quieter with a mild tone. THE IMAGE SHOWS THE ACTUAL FIAT 500 ULTER EXHAUST REAR SILENCER. BUY DIRECT FROM THE ULTER U.K. DISTRIBUTOR. The silencer is designed to fit directly onto the Fiat 500 1.2 and 1.4 petrol models built in the date range 2007 onwards. 2.5" Swap Restrictive Cat For Decat Adds Instant BHP! 200CPI SPORTS CAT & 2.5" BORE ADDS INSTANT BHP! All Remus exhaust systems are TUV approved and built to exacting standards using high grade stainless steel and heat resistant black ceramic paint. In addition to this, Remus use a purpose built high tech acoustic room to test the sports sound of each exhaust on the car. Fits : 2001-2006 MITSUBISHI LANCER EVO 7 8 9. High quality stainless steel exhaust pipe. We will be happy to help you find the right parts at the right price. Get The Right Parts You After. ware house in Australian, New Zealand, HK, USA and UK, our sales teams have professional knowledge of automotive parts, so our service is second to none.